Mooncalf1988 - After a ton of playtesting, I added the mana dorks like you recommended. It just makes sense, lol. I also stumbled upon Tangle Golem when I was going through my collection. 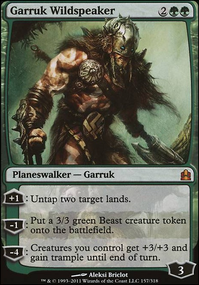 I was thinking of building a Ghalta deck, seems like a fun, simple, stompy deck! i like your idea of crewing vehicles in order to get Ghalta out sooner. Very Clever! 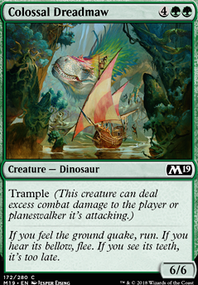 Not sure about your play group, but I would imagine you wouldn't need any "fight" cards if you have lots of big creatures with trample? perhaps a card like Predatory Focus can get around it if is an issue? If you have some $$ to spend I believe there are some cards that would really benefit your deck. Managorger Hydra, Manaplasm, Omnath, Locus of Mana, Kalonian Twingrove, Regal Behemoth, Tangle Golem. GattisonThat is a short list! I have most of them. 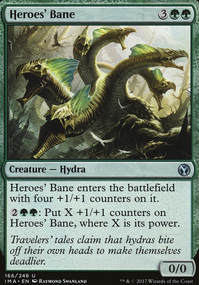 Interesting that Tangle Golem doesn't have trample when the others of this cycle have a on-color keyword. 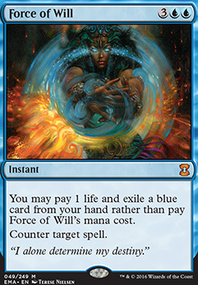 Snips500 Would you consider adding the Affinity-like keyword "Improvise" cards to your list? A Bloodbriar/Tukatongue Thallid/Rot Shambler/Emrakul's Evangel beatdown/sacrifice/bulk up build with a bunch of token producing critters, sac outlets, and stuff that gets bigger when you sac stuff. Sakura-Tribe Elder and Utopia Mycon could also assist a ramp style sacrifice deck. 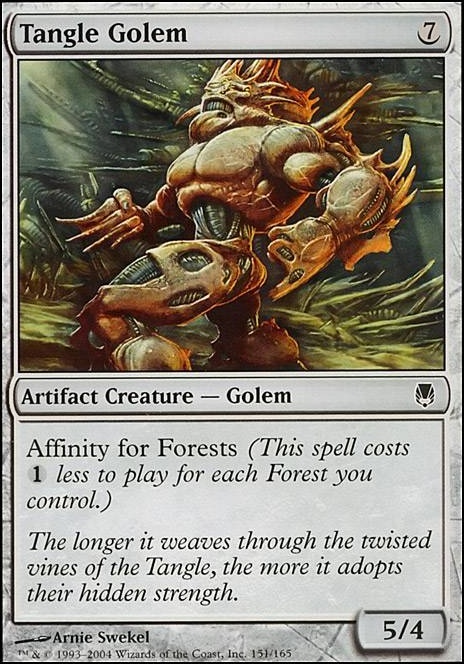 Theres also the possibility of an Eldritch Evolution/emerge combo deck running creatures like Root-Kin Ally/Tangle Golem for a cheap Decimator of the Provinces Mockery of Nature and convoke token generators like Scatter the Seeds or similar. A 'stall for big spells' is also a thing- Thelonite Hermit doesn't use the stack for morph, so running a control setup aiming to get him morphed on the battlefield with Aspect of Mongoose on him is possible. Fog/Blunt the Assault/Brindle Boar/Gristleback etc to stall to midgame then cast some high value eldrazi or beating down with Moldgraf Scavenger/Undergrowth Scavenger and similar delirum will work. Harrow will help a lot with this. Splashing blue could allow for Prophet of Kruphix shenanigans, and that blue/green return to hand emerge eldrazi, along with combo options. Splashing black could also allow Distended Mindbender and Nezumi Bone-Reader for hand control. If you decide the archetype you want to play (aggro, midrange, control) I'll try to come up with cards to help support it. Building something strong normally involves emphasising its strengths as much as possible- meaning some cards get silly expensive, but cheaper cards with synergy to almost match them exist. Good luck and happy brewing. 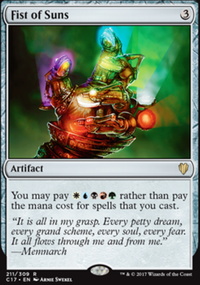 I'd recommend removing Tangle Golem, replace him with Eldrazi Devastator if you want trample or Hand of Emrakul for alternate casting cost. Yeah, Utopia Sprawl and Lotus Petal are the most expensive pieces of the deck. 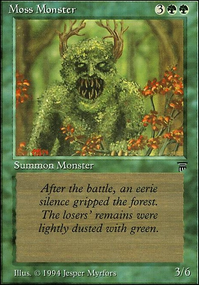 They are sorta key for this as they grant you consistency when bringing Land Destruction as early as turn 2, which is mostly the average CMC for lots of decks, being also possible to cast Mwonvuli Acid-Moss on turn 2 which is a blast.If you can't afford this, you'll most likely lose consistency in that, so I'd probably go for something completely different like defenders which may help on the ramp like Overgrown Battlement/Wall of Roots, beaters like Tangle Golem, Self-Assembler or Hooting Mandrills to have some earlier threats or even Fierce Empath for fetching Ulamog's Crusher. Penumbra Spider or something with reach is also stuff you want to include somewhere in your 75 cards, so consider that as well. Espero que isso tinha sido til cara. KKKKK.